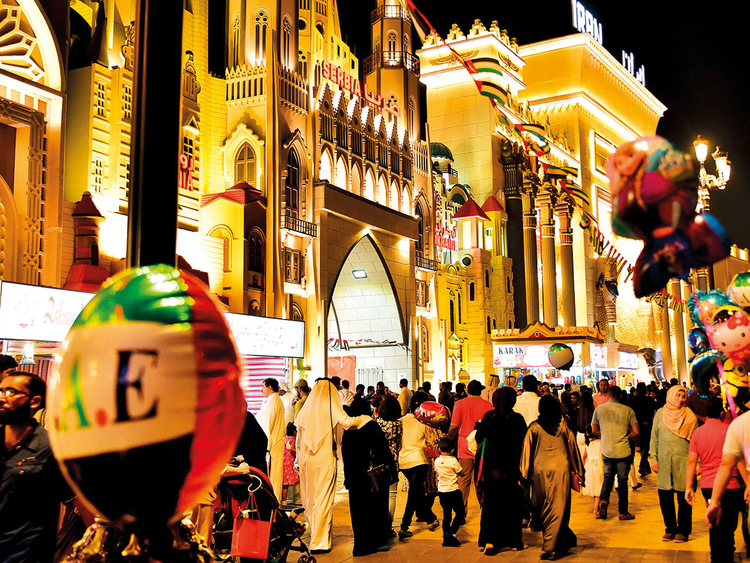 Dubai: Global Village will be holding a line-up of events and interactive activities for visitors in celebration of the UAE’s 47 National Day during the long-weekend from November 30 to December 3. The park will be hosting two exclusive events- starting with a special concert by Emirati star Hamad Al Ameri on December 2, at 9pm, followed by an Operetta titled ‘Zayed: Leader of the People’ — which will take place on the main stage on December 1, 2 and 3. “This will be performed by more than 30 cast members and will be our dedication to the founding father of the UAE, late Shaikh Zayed Bin Sultan Al Nahyan. The Operetta will be produced by Ornina Arts and Events and directed by Nasser Ebrahim who is well known across the region for developing some of the finest national and international shows,” Bader Anwahi, Chief Executive Officer, Global Village, told Gulf News. During the National Day weekend, the park will also host engaging activities including free henna drawings, face paintings as well as the opportunity for guests to participate in painting a five meter wide UAE flag with their fingerprints. Another key highlight of the park’s celebrations this year will be an interactive vending machine that provide guests with a token to win exciting prizes when they recite the UAE National Anthem. “We will be hosting the UAE’s biggest gathering for National Anthem recitation this year with the participation of Global Village’s 10,000+ partners as well as our thousands of guests on December 1-2,” said Anwahi. During these two days, the UAE’s National Anthem will also be played out loud across the park’s speakers. Meanwhile, a Ribbon Maze will be set up with thousands of ribbon decorations in the colours of the UAE flags, and more than 50,000 UAE flags hung up across the park. Celebrations will also include several Mega Musical Fireworks displays on November 30 as well as December 1-2 starting 9pm. The UAE pavilion will transport its guests into a ‘wedding-like’ atmosphere where they will be greeted with various Emirati cultural shows, including Ayyala, Harbiya and Razfa. “For this occasion, special decorations are added to the pavilion and guests are greeted with Arabic coffee and dates as they appreciate displays of some of the finest Emirati live handicraft stations,” said Anwahi. For its 23rd season, Global Village has gathered a wide diversity of Emirati offerings not only in the UAE pavilion, but in the newly introduced Khalifa Bin Zayed Al Nahyan Foundation Pavilion, AlSanaa Pavilion by Ministry of Community Development, Live Our Heritage Festival by Dubai Culture, Heritage Village by Hamdan Bin Mohammad Heritage Centre, Creative Hands initiative and the gathering of Emirati businesses in collaboration with Dubai SME at the Cultural Gate entrance. “With their involvement, our Emirati Cultural Zone is well-positioned to highlight the best of the Emirati culture to our millions of guests, including residents and tourists,” said Anwahi. Date: November 29- to December 3. Time: 4pm until 1am (extended hours till December 2).